On our way up the Maine coast to pick up our next load, we passed through Freeport. As soon as I knew we were headed in that direction I made plans to stop at the L.L. Bean Flagship Store. Parking was tight since it's on Main Street downtown, but it was after Memorial Day, during the week, and raining. I figured we'd luck out finding something and we did. Ed was behind the wheel so we could have parked in a spot designated for a Smart Car with his parking skills. The L.L. Bean "complex" was great. It included the main flagship store, the Bike, Boat and Ski store, the Home Store, and the Outlet store, all within feet of each other. And they're all open 365 days a year, 24 hours a day. This particular store, which opened in 1917, has been open 24 hours a day since 1951 with only four exceptions - two days to comply with state blue laws, and two days to honor the deaths of President Kennedy and L.L. Bean himself. I really wanted to buy one of the classic Boat and Tote bags, the quintessential L.L. Bean item (other than their Bean Boots - see photo), but I couldn't make a decision. All the ones I've seen, having been washed who knows how many times, were soft and pliable. The brand new totes, since they're made of canvas, are stiff and scratchy. Of course, I know the softness happens over time, and I found some information online about how to speed up the process, so i wont have to wait years and years to get the desired effect. I also like that they make them with the option of a longer handle, which makes it a great shoulder tote. After seeing several people at the Tim McGraw concert carrying their snacks and extra blankets in their boat and tote bags, I knew I had to have one. Clearly these iconic bags are a real Maine thing. I may have left empty-handed on this visit but once I decide on a color, a Boat and Tote will be mine. Because in 1912, Leon Leonwood Bean started this little thing called the mail order catalog. We finally made it to Bangor, Maine and yesterday was our last day off. The weather was gorgeous so we decided to take out the bikes. We found a path by the waterfront we wanted to ride but the only truckstop in the area was six miles away and the roads to get from there to downtown weren't the most bike-friendly. So we got on Google Earth and scoped out a place that was closer to downtown. In the course of our search, we found out there was going to be a concert at the waterfront pavilion later that evening. 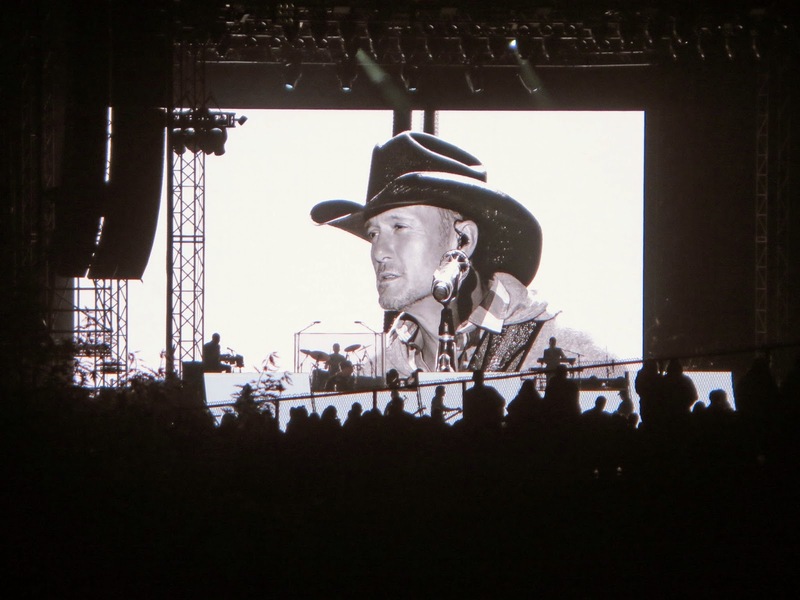 Tim McGraw was playing. He was three weeks in on his Sundown Heaven Town tour. Opening for him was Kip Moore (I have no idea who he is) and Cassadee Pope (The Voice season three winner, who I do know). We were excited to have found something happening on a Thursday night in a town we knew nothing about. The waterfront area was quite pretty with a path running along the river. We rode for a while, then went to a riverfront restaurant for lunch. After lunch, we looked for a spot to watch the concert. 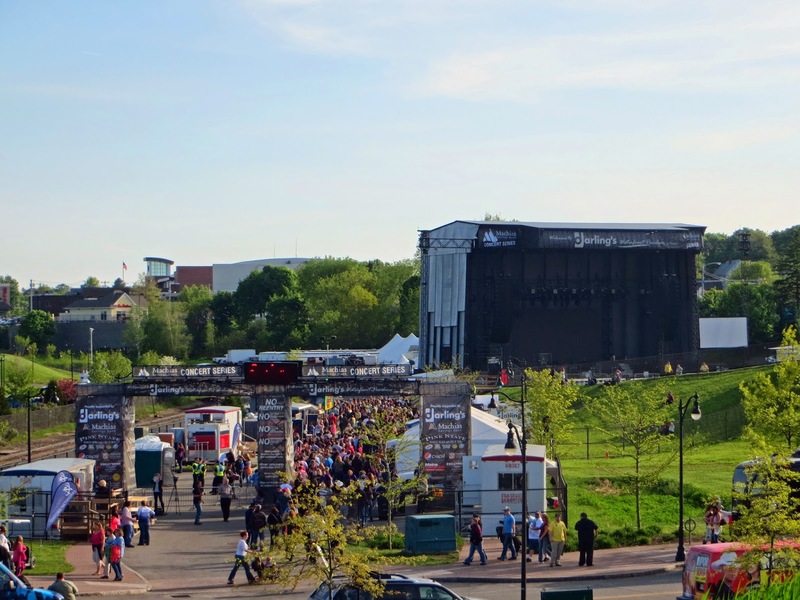 Here you can see the two Eds in a unique panorama of the river and concert stage taken from the hill across the street, where we perched ourselves for the concert. We sat for a while people watching before the concert but it was getting a little chilly and the temperature was rapidly dropping. It started out as a sunny seventy-three, but then it dipped about ten degrees and the sun hadn't even set yet. 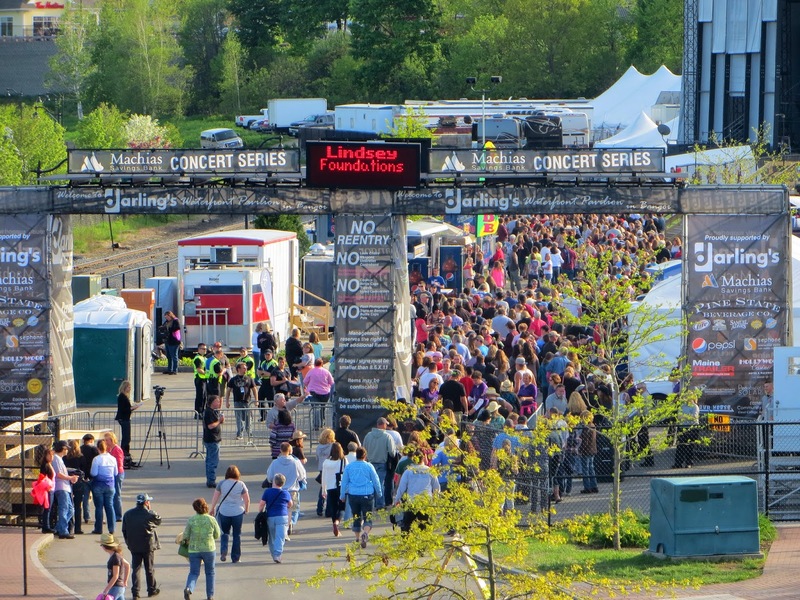 So before the concert started, we rode back to the truck - a different way than we came, which I thought looked like a shortcut on the map, but wound up being a grueling trip up some insanely steep hills - to get our lawn chairs and change into warmer clothes. Long pants, long sleeves, and a winter coat. I kid you not. People were streaming in and I was amazed at how scantily dressed some of the girls were, Daisy Dukes and cowboy boots. Great outfit for a country concert, but not in sixty-degree weather. My winter coat and pashmina weren't even warm enough, and you know I'm never cold. It was fifty-three degrees by the time the second act went on but we were determined to stay until the end. It was a free concert for us and we had seats that were comparable to those in a concert arena. We couldn't really see the artist on the stage, but we had a great view of the screen above it and the sound was bold and clear. We wound up leaving just before the concert ended because it had gotten really cold and we wanted to avoid the mad rush of bodies. Before we rode off, we got a little closer to the fencing near the stage area. It was standing room only. 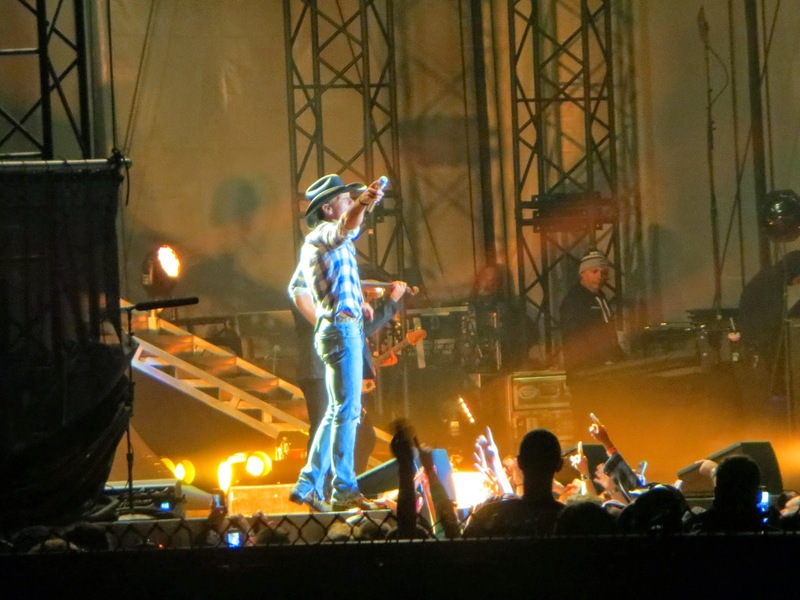 From that location, we were able to see Tim McGraw pretty clearly. He's sooo skinny. I'm pretty sure he waved to us as we left. OK, maybe he was waving to the entire crowd but it felt like just us. After all, we were the only ones leaving. After the concert, we had breakfast for dinner at Dysart's, a truckstop in Hermon that's been around for over forty-five years. It's been a while since we'd been up this way and the restaurant was just as great as I remembered. This has been a really great two weeks but now it's time to get back to work. Tomorrow we pick up our load and head to the hot and steamy south. And instead of complaining about how cold it is, I will begin the complaints about the stifling heat and humidity. 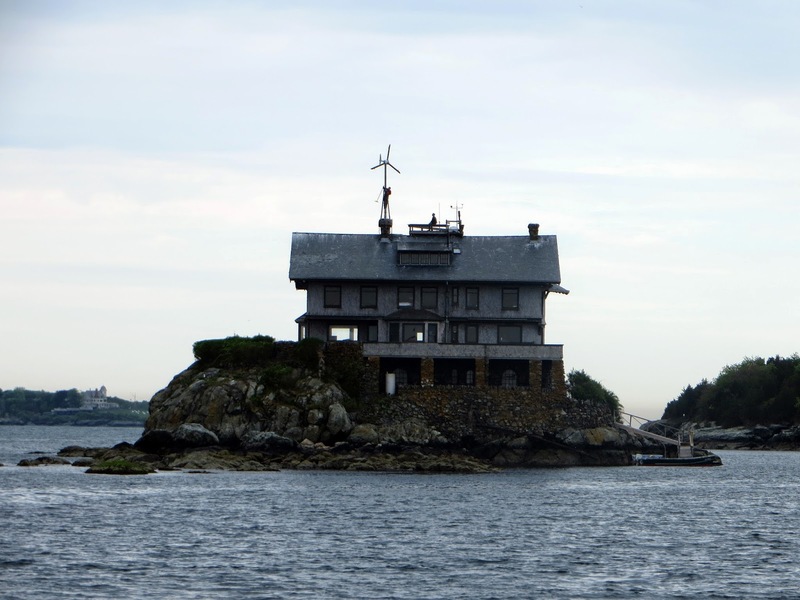 Here's a house we saw on our sailboat trip. When we passed by there were two men on the roof trying to get the wind generator going. They were eventually successful as we saw it go from standstill to spinning as we sailed by. There's an interesting story behind it. Read it here and see more photos here. 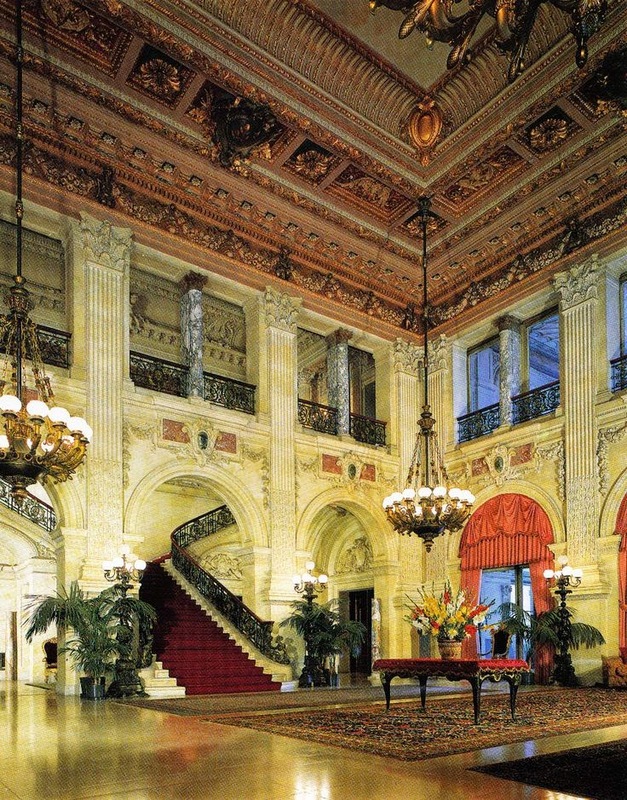 On our first day in Newport, the first thing we did was head to The Breakers. We were there too late to tour the house and grounds so I settled for a picture of the front gate. The next day we headed there first thing in the morning, it opened at nine and I wanted to be among the first in line. Because we were there the week before Memorial Day, we didn't even encounter a line. Ed and I were the only ones on the great lawn and the only ones walking the exterior of the house. We imagined this is what it must have felt like in the late 1800s, taking an early morning walk down to the water, the only ones awake being you and the servants, who of course were waiting for your return to serve you breakfast. This is a side view of the house. On the other side of the glass door lies the music room. Here's Ed on the back lawn, surveying the thirteen acres of his land. The house contains 70 rooms encompassing 138,300 square feet of space on five floors. 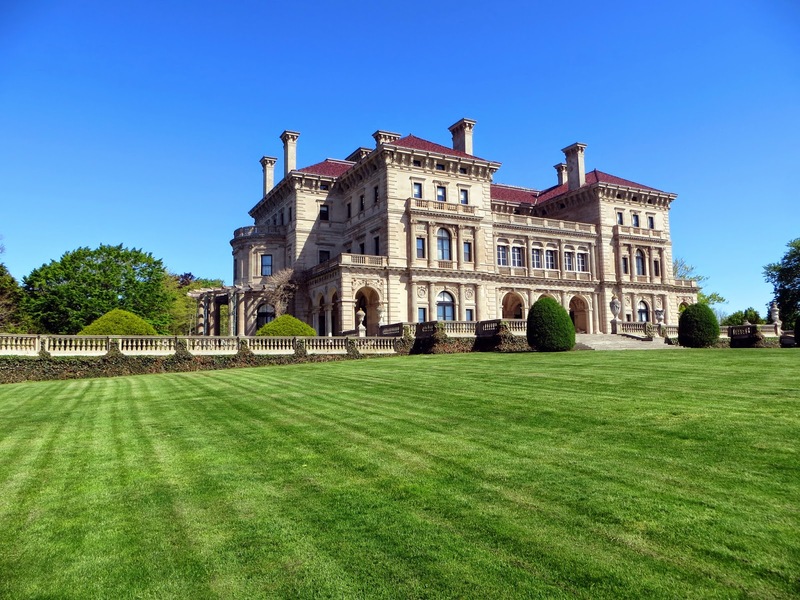 The Breakers is the summer cottage of Cornelius Vanderbilt II. His brother, William Kissam Vanderbilt, built Marble House just down the street to use as his summer cottage, and his other brother, George Washington Vanderbilt II, built my favorite mansion in the country, The Biltmore, in Asheville, NC, to use as his summer home. These people really had it made, didn't they? What an incredible period of wildly ostentatious wealth. Such obscene amounts of money. Vanderbilt died at the age of fifty-five, leaving The Breakers to his wife Alice. Alice lived for thirty-five more years, dying in 1934 at age 89. Alice left the house to her daughter Gladys Széchenyi. 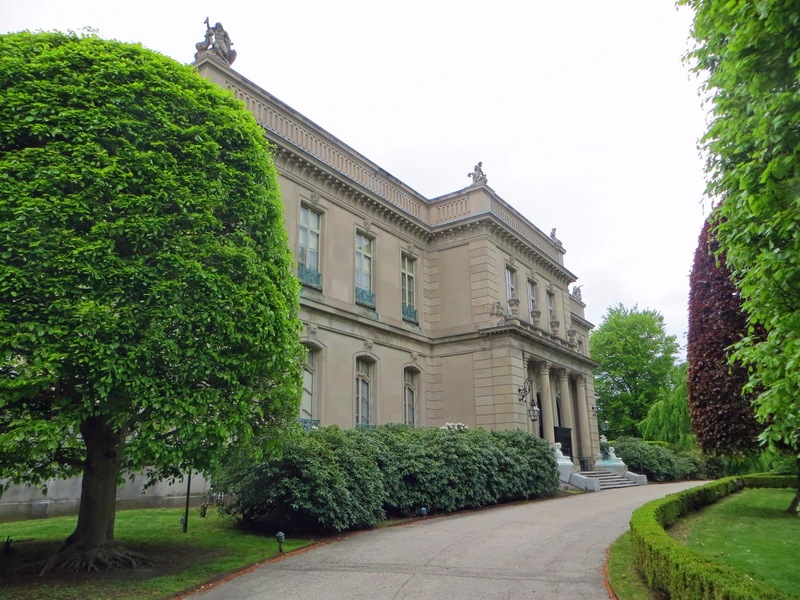 In 1948 Gladys leased the property to The Preservation Society for $1 a year, and in 1965 when she died, the house went to her daughter, Countess Sylvia Szapary. With an agreement in place granting her life tenancy, The Preservation Society bought the house and 90% of its furnishings from her in 1972 for only $365,000.00. When Sylvia died in 1998, the Society agreed to allow the family to continue to live on the third floor, which is not open to the public. During the visit, I approached a chatty young guide and asked her about the third floor thing. "Does the family still live here?" She looked around, lowered her voice, and said, "We're not supposed to say anything about that, but yeah, they do." I asked what the layout was up there. How many bedrooms? Do they have a kitchen? Are they self-contained when they're here? She said, "We're not allowed up there but they must have a kitchen because one time someone up there was cooking bacon and the smell was going through the house. Some visitors were asking about the smell, wanting to know if they were trying to make it seem as if people were there. We just went along with it and said, 'uh, yeah'." So how cool is that??? Descendants of the Vanderbilts might possibly be in the house while visitors are touring it! I'm blown away by this information and want to be a spy to find out more. I think it's the juiciest bit of information I found out about the place. I think it may even be better than the view from the lower loggia of the house. So that's it for the photos I took. And again, because we can't take interior photos, the ones below I found on the internet. 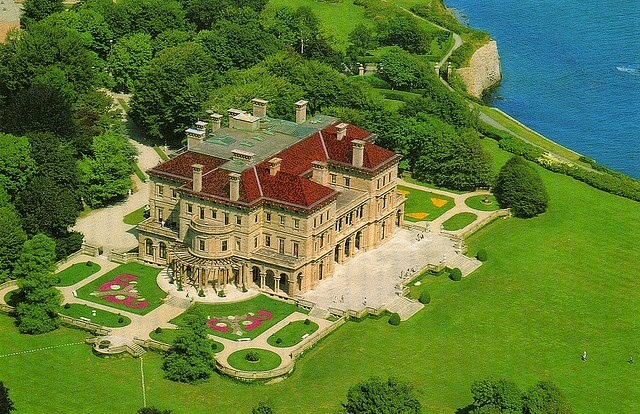 This first one shows an aerial view of The Breakers. 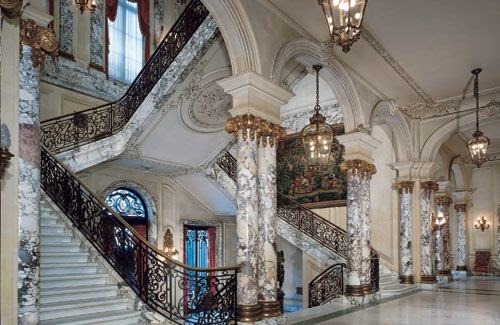 This is the Grand Entrance Hall. And the beautiful Music Room. The rest of the house was just as fantastic. The tour comes with an audio program and at various points throughout the self-guided tour, there are additional recorded facts about the house, the occupants, the furnishings, the art, the people who worked there, etc. At the touch of a button you can hear details that greatly enhance the tour and draw you into their world. I am so impressed with these mansions, and so incredibly intrigued, I know I'll be reading and researching for a long time into the future. I think I've already almost broken Google. ** About the blog post title regarding acorns: The Vanderbilt family emblem is the acorn. They are seen throughout the house and the ceiling of the great hall details four medallions displaying acorns and oak leaves. Cornelius Vanderbilt, who built his fortune from nothing, felt it represented longevity and strength. Well, his acorn certainly did grow into some mighty impressive trees. 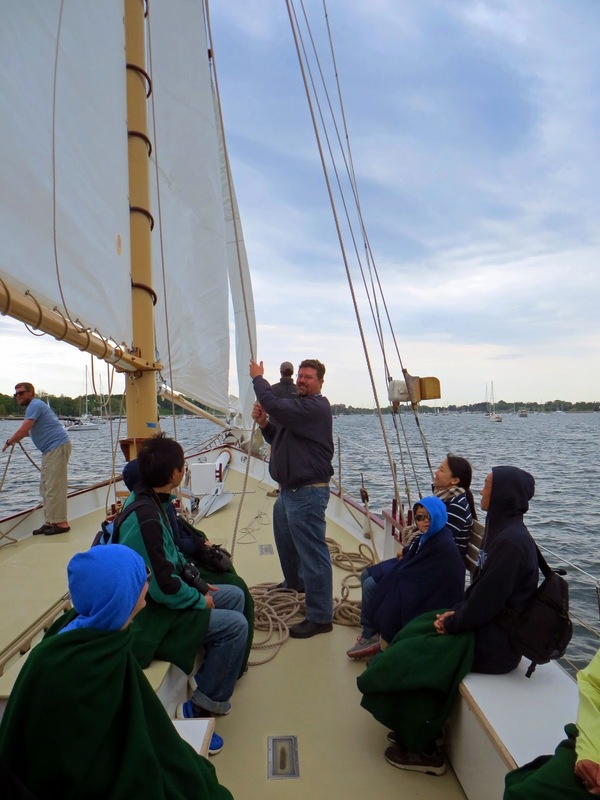 Yesterday we took a sail on the Schooner Aquidneck. 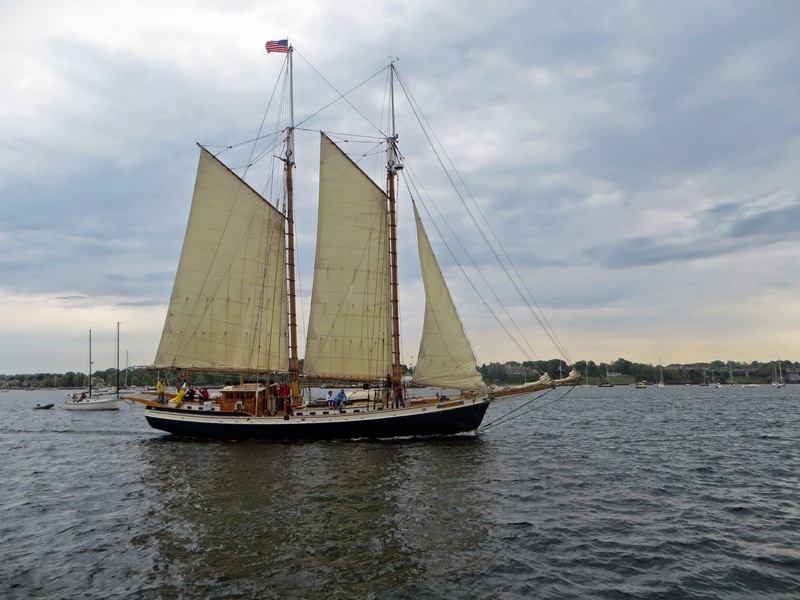 An 80-foot long vessel with a three-person crew, we left Newport Harbor and ventured into the Narragansett Bay for almost two hours. This is the Aquidneck passing in front of the Castle Hill Inn. It was our eighth day in Newport and wouldn't you know it, it was the one day we didn't have sun. The weather channel had been lying all week about the rain, but today they got it right. The rest of the week has been gorgeous, which to me means less than seventy degrees. Closer to sixty is even better. A sixty-degree day with sun is heavenly. A sixty-degree day on a boat with a lot of wind, which of course is ideal for sailing, and no sun, is what I'd call a little too chilly. And when have you ever heard me say I was too chilly? I was wearing a thin cardigan but it wasn't quite enough. Thankfully, the crew handed out fleece blankets. The chill didn't stop Ed from helping hoist one of the sails; with a huge smile on his face, of course. And one of the crew members on the boat, Ben Zartman, we came to find out, not only lives on a boat with his family (wife and three girls! ), but has sailed to numerous countries, writes for several boating publications and websites, and even has his own blog! You can see the poem in its entirety here. On our trip, Ed took a few pictures of other boats we passed. 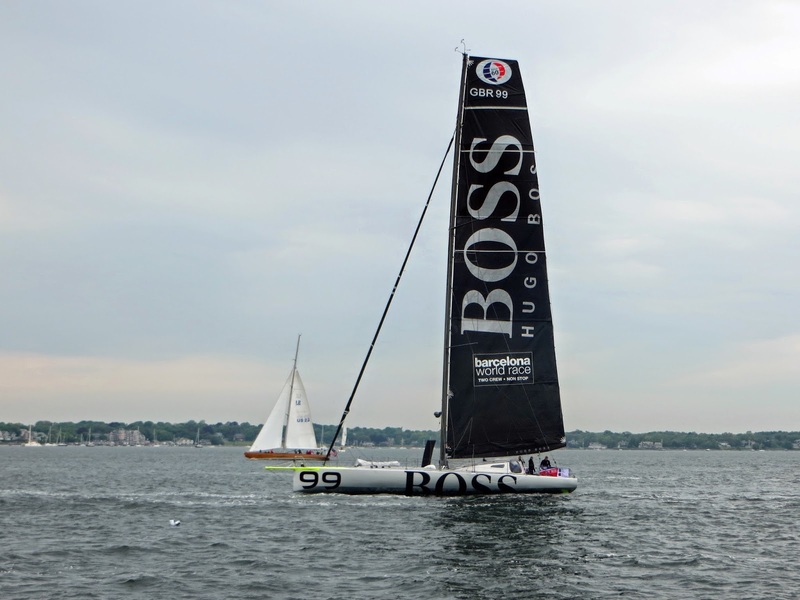 This is the Hugo Boss boat, from the Barcelona World Race. It was in Newport to have the mast repaired, which broke at the beginning of the month. Watch skipper Alex Thomson walk to the top of the mast in this video. There are no daring mast walks on this next vessel, but here's another sailboat (or schooner, I guess) that Ed saw and liked. We kept hoping the sun would peek through to at least give us some good light for photos but it never happened. We even had a few sprinkles get us. Such is the life of a seafarer. Ed's eyes were as big as saucers looking at all of these boats. His "life on a boat" dream must have been flying through his head at warp speed. I'm still not keen on the idea, but I can see some of its appeal. Mostly the travel part of it, not the actual boating part. And I'd never do it on a small boat. Ever. 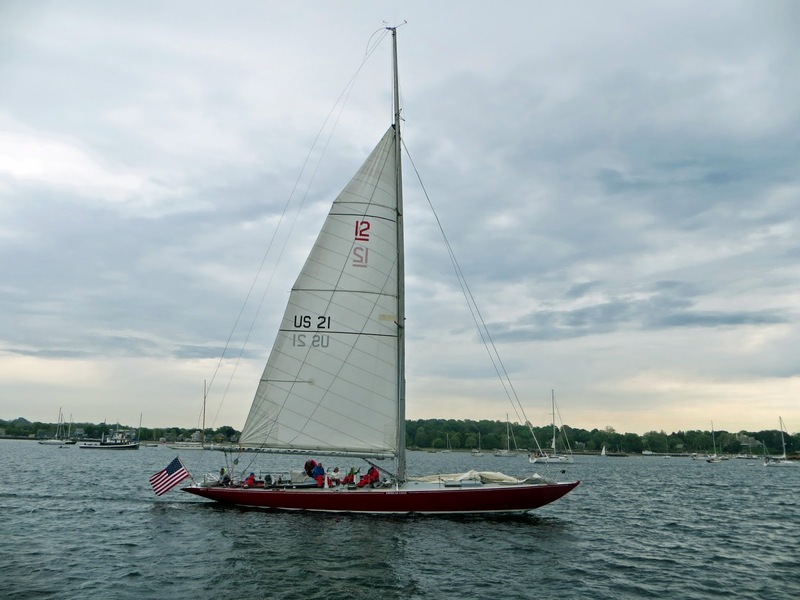 The next boat he saw, which was pointed out by the crew, was this 12-metre racing sailboat built in 1964, named the American Eagle. At one time this was Ted Turner's boat and it was a repeat America's Cup champion. It's available for charter if you want to know what sailing on a racing yacht feels like. 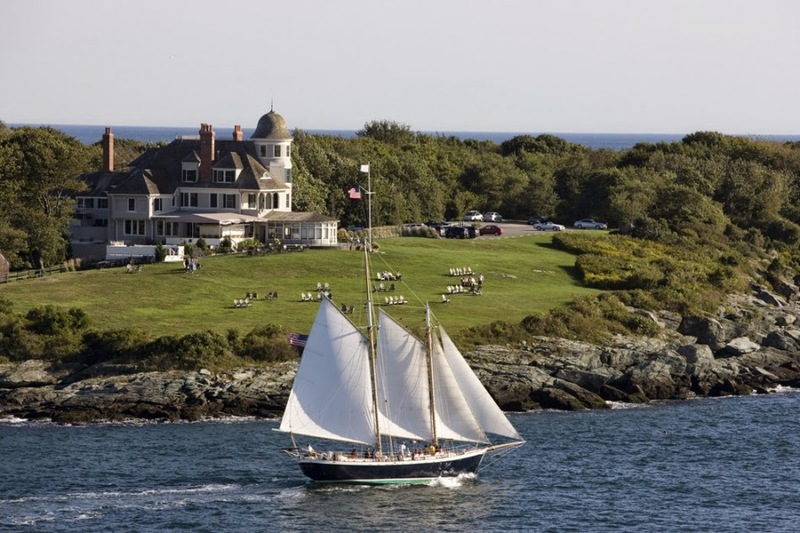 It's no wonder they call Newport the sailing capital of the United States. I don't think I've ever seen as many sailboats in one place at one time, various sizes of white triangles silently passing each other on the horizon. Our time here has really been wonderful. We toured every open mansion in Newport (six of the nine), visited the Green Animals Topiary Garden and Home, ate in a different restaurant every night, roamed the shops in town, took a spin along Ocean Drive, and even visited nearby Plymouth to see the famous rock. 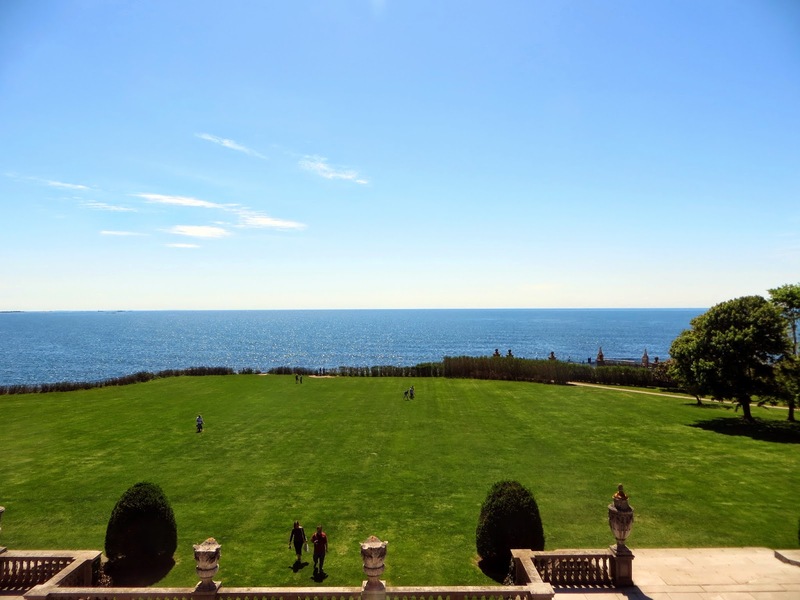 On our next visit we plan to take the behind-the-scenes Servant Life tour at The Elms and also see Rough Point, Doris Duke's mansion. 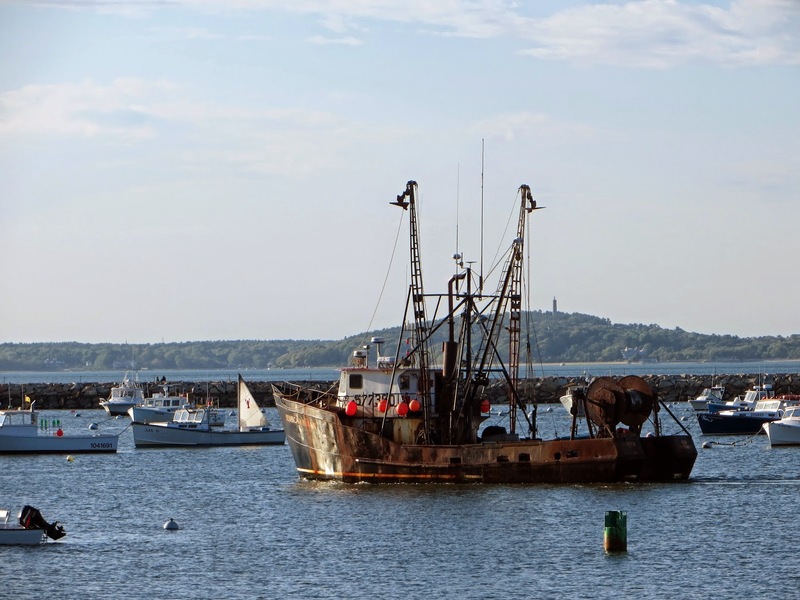 Trawler leaving the harbor in Plymouth, Massachusetts. Today our journey took us first to an L.L. 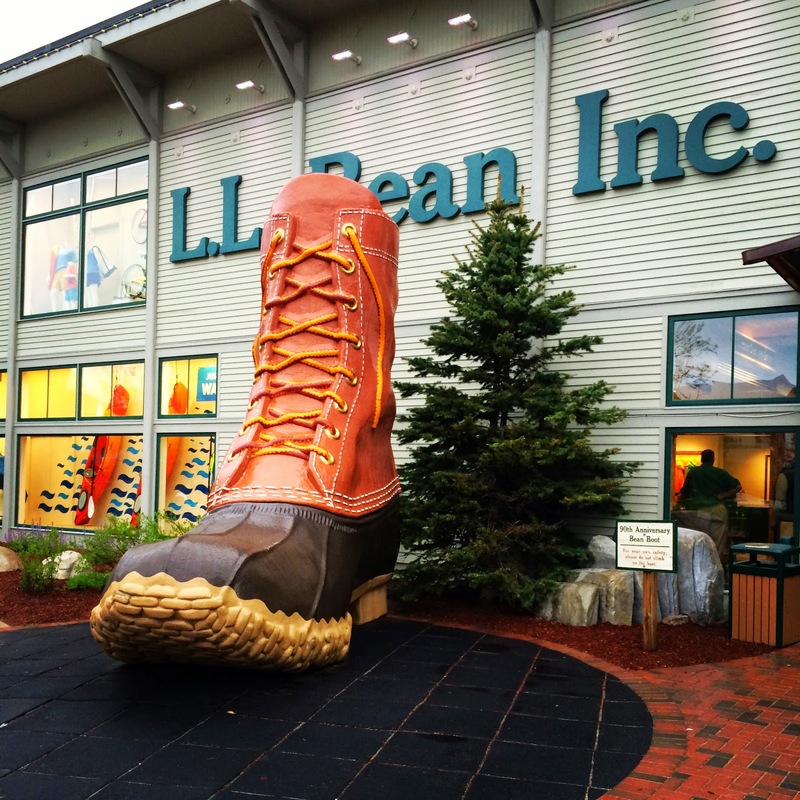 Bean outlet store (planning to visit the flagship store in Maine next week), and the to Plymouth, Massachusetts to see....you guessed it! 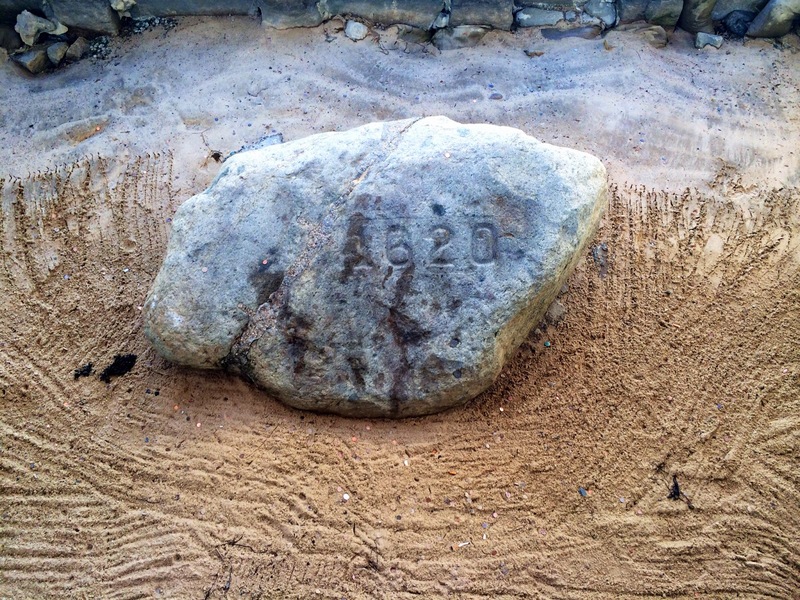 Not at all what I expected, but then after reading the Wikipedia entry about Plymouth Rock, it actually is what I expected. Below is another panorama shot (I'm really starting to like this option on my iPhone) where you can see, on the right, the structure with columns where the rock is housed. In a deep pit, with a fence around it. I guess so it can't be stolen. ??? We walked along the waterfront - the weather here has been gorgeous - and then went for dinner at a seafood place on the wharf. That makes seven days of dining out on lobster, shrimp and scallops. I never thought I'd say this, but I think I need a steak. Eh, who am I kidding? Here on the coast, even Ed isn't eating steak. In fact, today I saw him eyeballing a fishing vessel. Today we visited Chateau-sur-Mer. 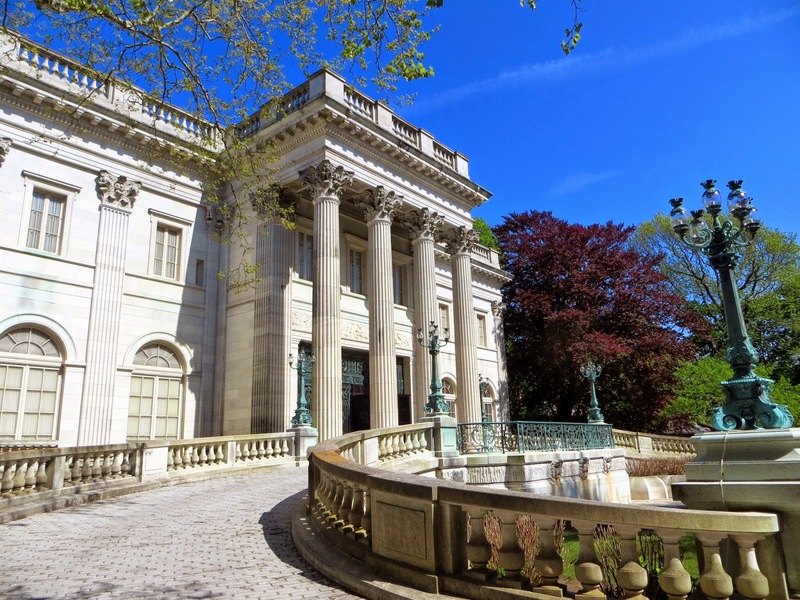 It was the first of the grand Bellevue Avenue mansions, and its grand scale and lavish parties ushered in the Gilded Age of Newport. 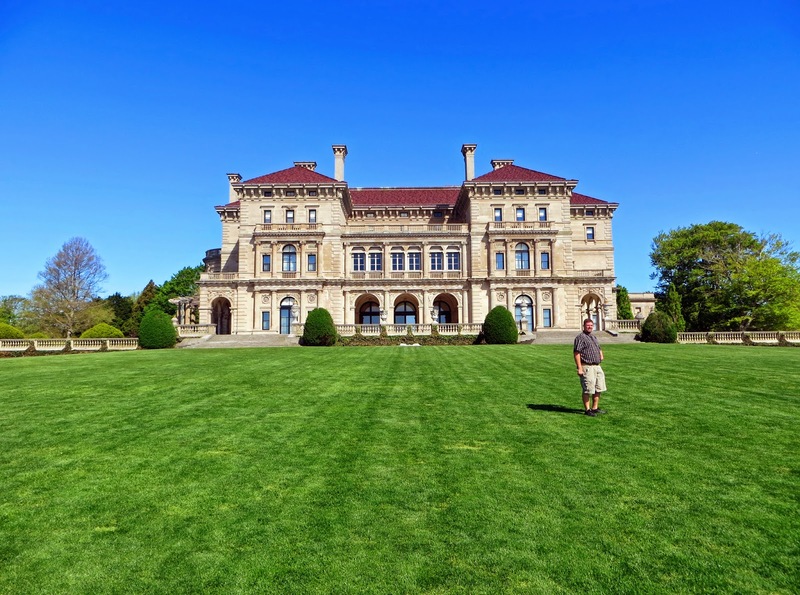 It was the most palatial residence in Newport until the Vanderbilt houses were built in the 1890s. 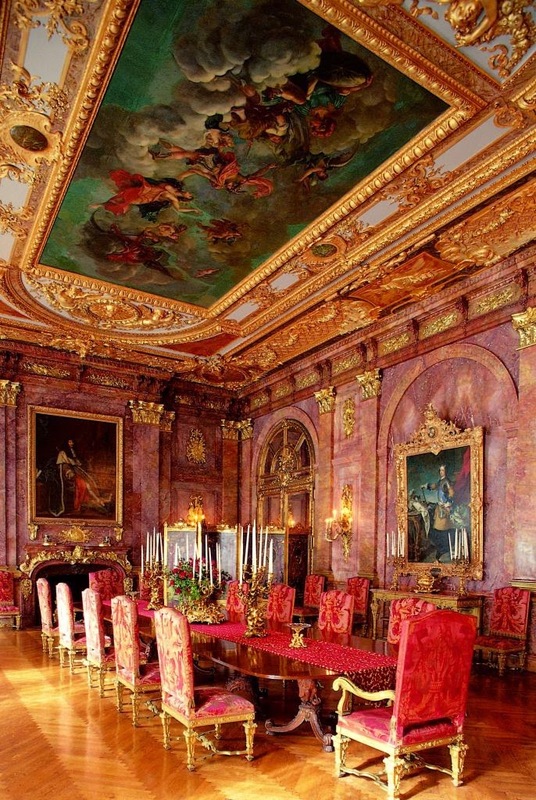 The house was less ornate than the other houses in regard to marble and tapestries and gold covering every surface, as the style of decor was different than the other houses, but it did have some really amazing elements. 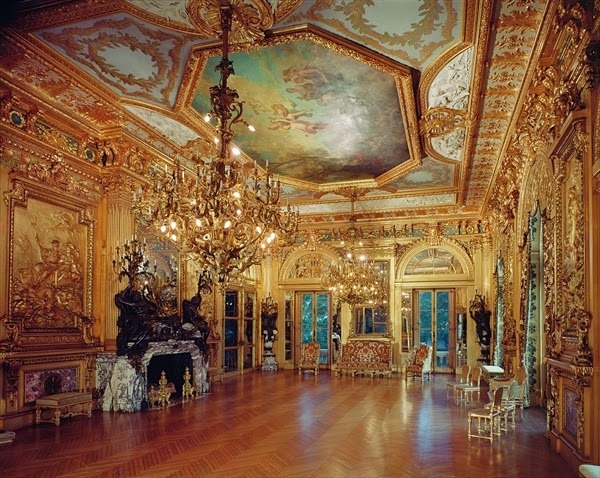 Incredible stamped, gilded and painted leather wallpaper in the dining room, stained glass ceiling in the center hall, and a seven-foot-wide mirror (a width of mirrored glass that was unheard of in that day and extremely impressive to guests) in the ballroom. Two rooms - the library and the dining room - featured carved elements by Luigi Frullini. 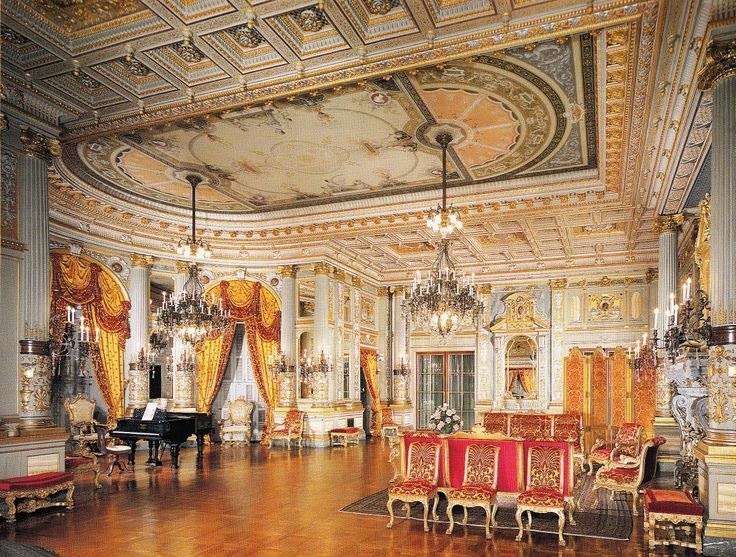 The pieces in the library, the woodwork on the walls, the bookcases, tables and desk and amazing coffered ceiling, was all carved in Florence, Italy and shipped to the home to be assembled there. Frullini also made the table and chairs in the dining room, the carved panels on the walls, a ceiling that featured bunches of grapes and frolicking cherubs, and an amazing fireplace and incredible sideboard. But the most amazing thing about this house wasn't even in the house. It was a tree. This tree, which you can see on the left in the picture above and on the right in the very last picture, is a Weeping Beech. 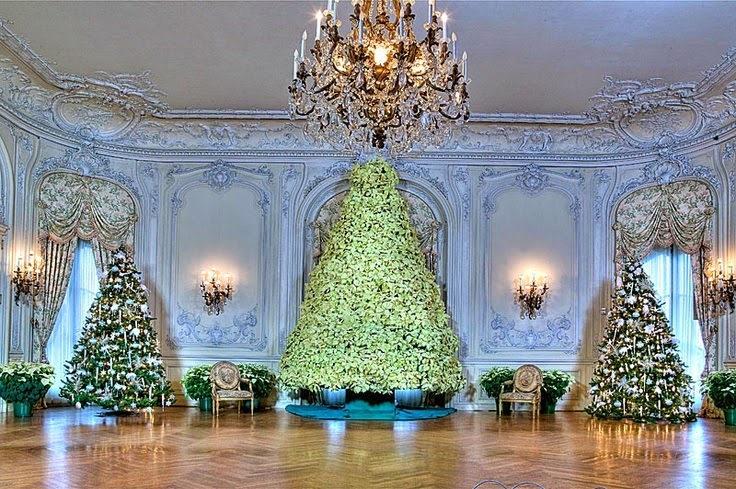 It was the most amazing tree I've ever seen. It was fifty feet tall and the canopy underneath was forty-five feet in diameter. Being underneath was like being in one of those childhood fantasy movies. Ed said, "You can live under this tree." If you click on the photo below, you can see a much larger panorama shot of the inside. The kids in the photo give you some perspective on its size. In closing, I'd have to say we really did like the house. Each one, with their stories (this house had an guided tour, as opposed to the others which had self-guided audio tours), paint such a vivid picture of this time period and the people who lived here. Each story is as amazing as the last. The houses are phenomenal. And the trees are spectacular. 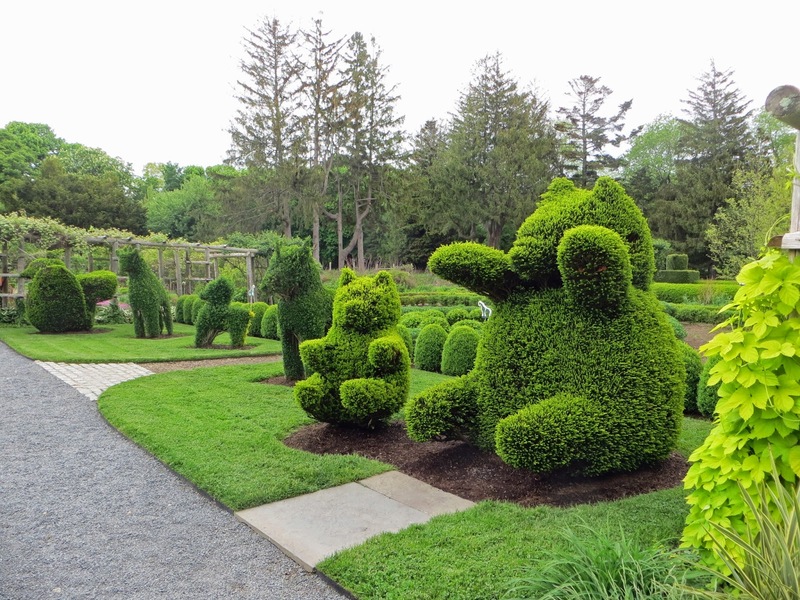 Today we went to visit the Green Animals Topiary Garden in Portsmouth, Rhode Island. It's part of The Preservation Society of Newport County and part of the tours included in the membership. The house, overlooking Narragansett Bay, was purchased by Thomas E. Brayton in 1872 and used as the summer home for his wife and four children. They turned it into quite a showplace. 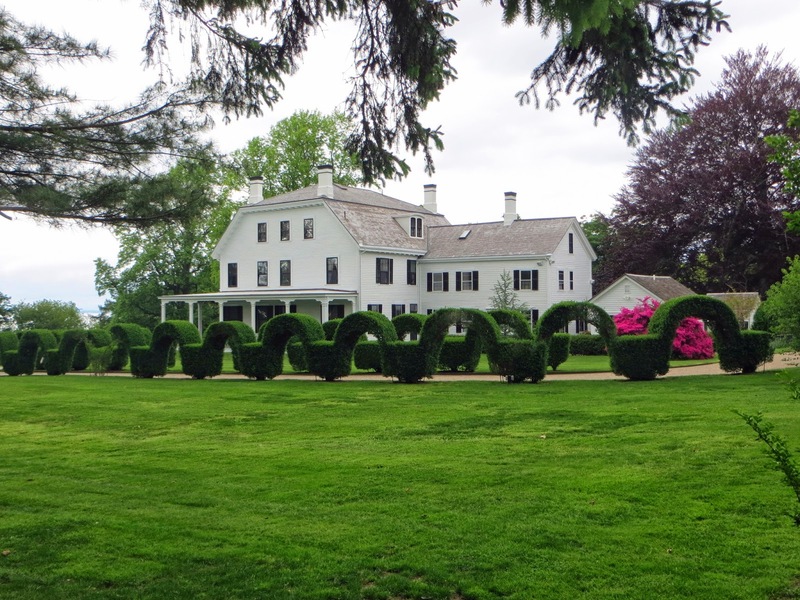 The 7-acre estate is the oldest and most northern topiary garden in the United States. 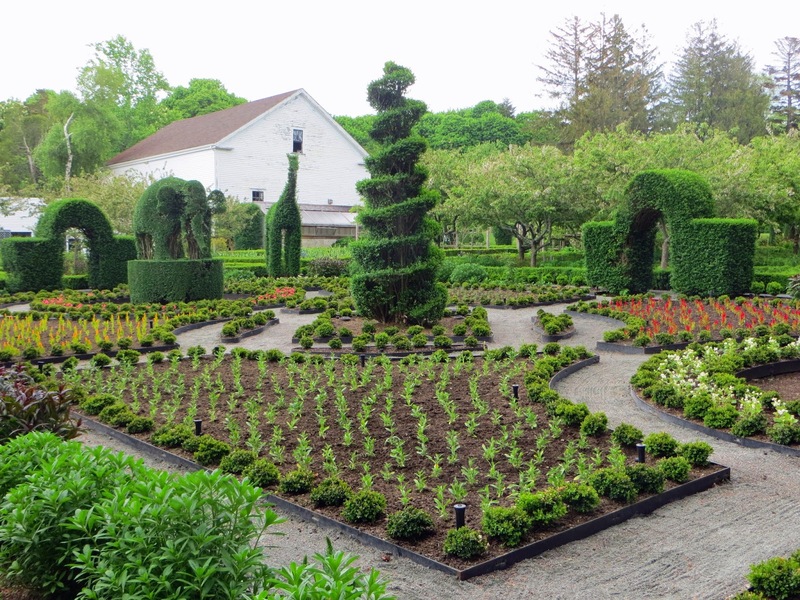 It contains over eighty pieces of topiary in addition to formal flowerbeds, rose and grape arbors, fruit trees, herb and vegetable gardens, a bamboo maze and prize-winning dahlias. The day was a little overcast as it's been threatening rain for two days. The clouds were rolling in and the sky getting dark so we made our way through the gardens first, before touring the house. The gardens were the real star anyway. 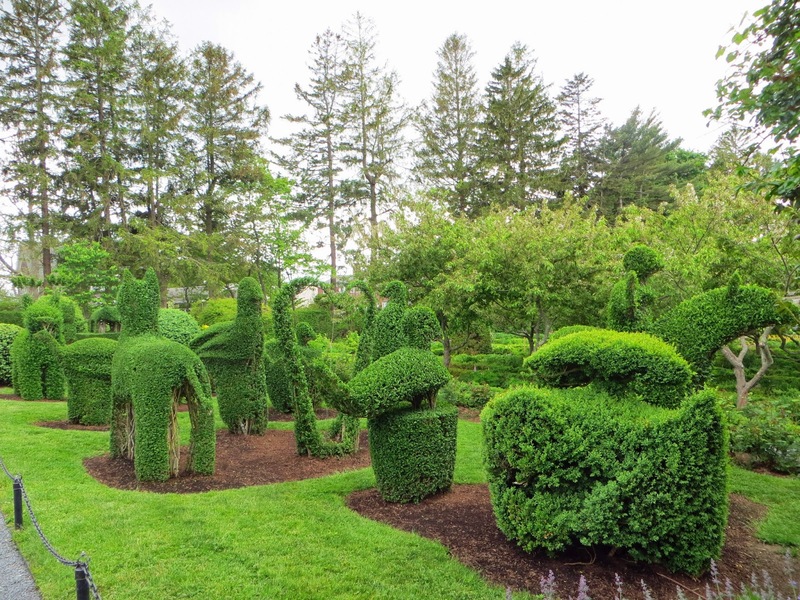 The gardener responsible for creating the topiaries was Joseph Carreiro, an immigrant from the Azores. 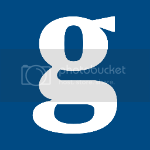 He was assisted by his son-in-law, George Mendonca. George and Joseph Carreiro's daughter, Mary, were married for 72 years and died one day apart. Him on February 1, 2011 at 101 years old and her on February 2, 2011 at 93 years old. I've never seen anything like it in my life. Trees carved into all kinds of shapes and objects, animals of all kinds; a camel, an elephant, a giraffe, unicorn. And these two fabulous bears. Most of the flowers were not in bloom yet, but we did see a few turning from buds to blooms. The summer is really when everything comes in and the staff told us that since they had such a cold winter and a late start to spring, everything was coming in later than usual. I can only imagine how beautiful it will be once everything is in full bloom. Maybe we'll have the chance to go back. After we finished walking the garden and touring the house, we went for delicious grilled shrimp and scallops at Evelyn's Drive-In, a place from Diners, Drive-Ins and Dives. After that, we went for coffee at the nearby Moose Cafe. A nice, leisurely day. And the rains never came. Today we visited our fourth Newport mansion, The Elms, owned by the Berwind family, who made their fortune in coal. We've been here for four days and have seen three other mansions so far - The Breakers, Rosecliff, and Marble House - and hope to add two more before we leave. 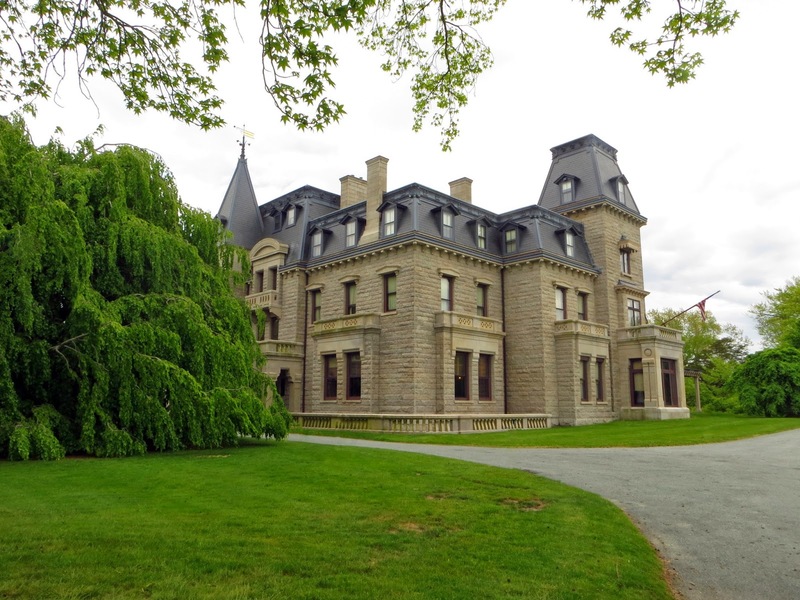 We bought a membership to The Preservation Society of Newport County, which allows us unlimited access to all of the mansion for one year, plus a few other perks. I definitely see us coming back to tour more of the area and I'd love to see the houses during the Christmas season. As with the other homes, interior photos are not allowed. I took the one above, of the exterior - kinda dreary because it was threatening rain, that we later got caught in - but the ones below are from online searches. First, the Grand Staircase. I love this entry hall. This the main floor, with the front door being just a few steps down to the left, in the center of the Italian breccia marble ionic columns. This is where we saw old fashioned light buttons, which when we asked the guide about them, said they didn't work. That wasn't the case as we found out, when at the end of the hallway Ed decided to try them and clicked the overhead lights on and off. Twice. The Elms was the first of the Newport Mansions to have complete electricity throughout. And like the other residents of the mansions, they were only in Newport for eight to twelve weeks each year. At The Elms, a staff of more than 40 was needed around the clock to keep the home running smoothly. 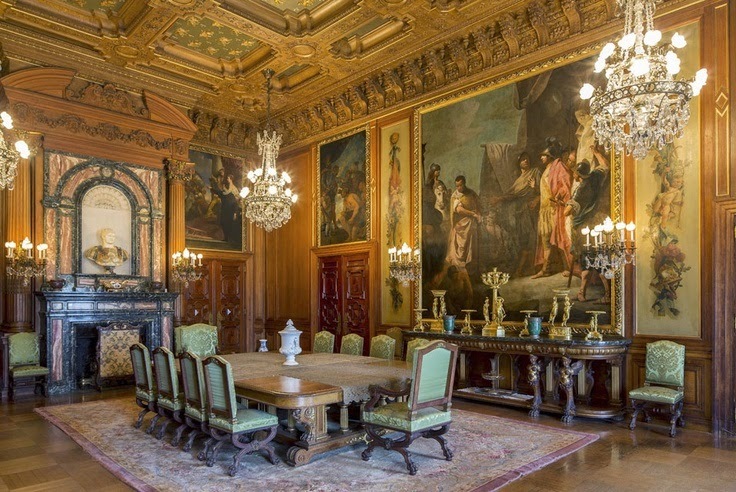 The Dining Room, where dinner was served promptly at eight o'clock each evening, easily sat up to 26 people. 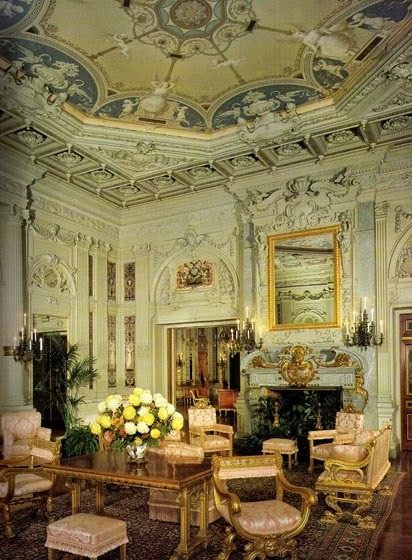 It was decorated in Venetian style and flanked by two large paintings. 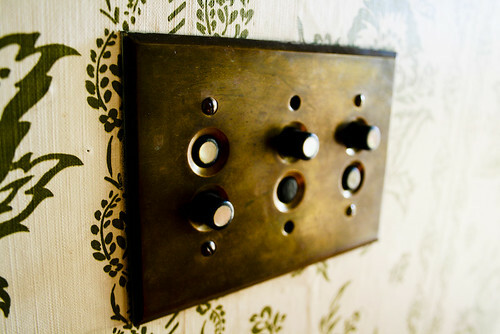 These were glued to the walls, which seemed to be a common practice in these homes. 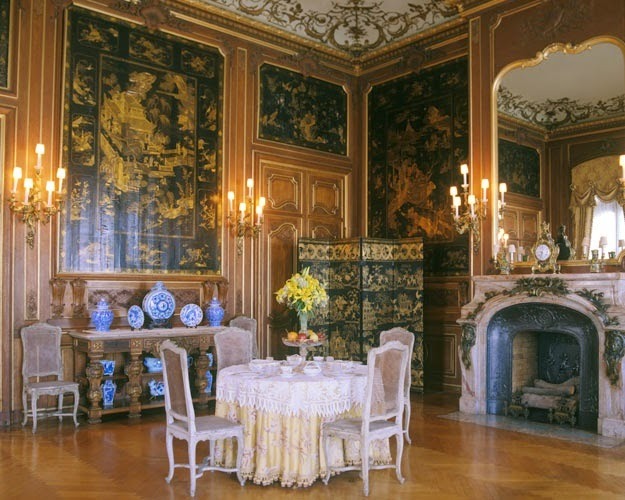 The Breakfast Room is decorated in eighteenth-century chinoiserie style, with three of the black and gold lacquer panels made in China during the K'ang Hsi Period (1662-1722). The Ballroom is gorgeous. Here, it's decorated for Christmas. It's located in the center of the main floor, with floor to ceiling windows that actually open to the back garden patio. 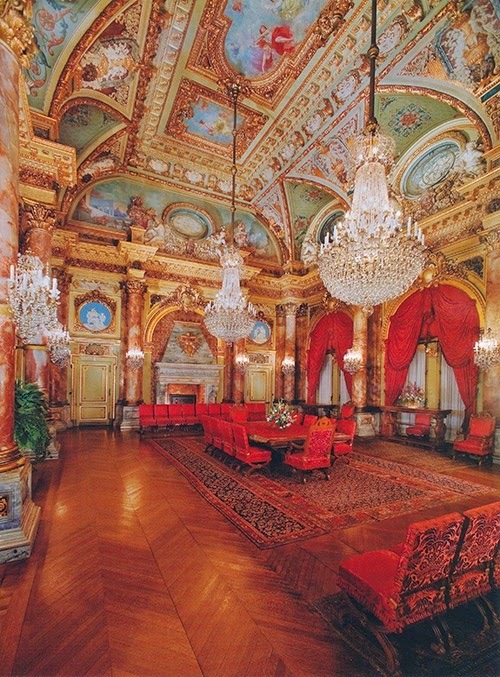 As in other locations of the house, the ballroom contained false doors which served to give the room symmetry - four doors on each side of the ballroom, but only two that actually opened. As many as 400 guests have been entertained here, with the Berwind's famous Naval Ball being the height of the summer events. 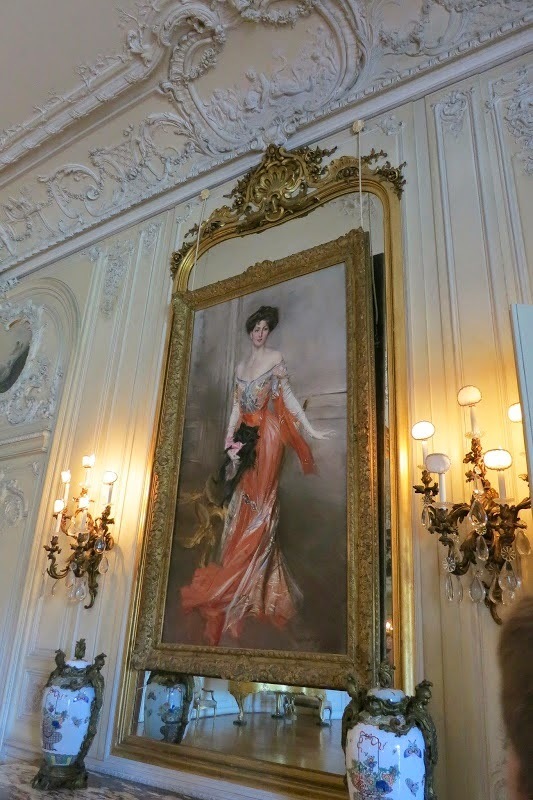 The ballroom also contains the Giovanni Boldini Portrait of Elizabeth Drexel Lehr, who lived across the street from The Elms, was a personal friend of the Berwinds. This is my absolute favorite portrait of all the ones we viewed, in all of the houses. The artist was known as the "Master of Swish" because of his painting style. You can see the swishy brush strokes more clearly here. The woman is memorable, her dress is stunning, the colors popping in the most elegant way. I'd love to own a portrait like this. She's just beautiful. Her husband, Henry Lehr, apparently disagreed. Face pale, laughter gone from his eyes, he sat down, facing his wife, "There are some things I must say to you and it is better that I should say them now at the very beginning so that there an be no misunderstandings between us. You have heard my orders to the servants, I presume? Well I intend that they shall be carried out for the rest of our life together. In public, I will be to you everything that a most devoted husband should be to his wife. You shall never complain of my conduct in this respect. I will give you courtesy, respect and apparently devotion. But you must expect nothing more from me. When we are alone I do not intend to keep up the miserable pretense, the farce of love and sentiment. Our marriage will never be a marriage in anything but in name. I do not love you. I can never love you. I can school myself to be polite to you but that is all. The less we see of one another except in the presence of others, the better." "But why did you marry me?" the bride asked. The groomed laughed. "Dear lady, do you really know so little of the world that you have never heard of people being married for their money, or did you imagine that your charms placed you above such a fate? I must tell you the unflattering truth that your money is your only asset in my eyes. I married you because the only person on earth I love is my mother. I want above everything to keep her in comfort. Your father's fortune will enable me to do so. But there is a limit to sacrifice. I cannot condemn myself to the misery of playing the role of adoring lover for the rest of my life." After all, at least I am being honest with you. How many men in New York, how many among our own friends have entered their wives rooms on their wedding night with exactly my state of mind but they prefer hypocrisy to the truth. If I am never your lover when we are alone, at least I will not neglect and humiliate you in public. What is more, you will actually gain by marrying me. You will have a wonderful position in society. As my wife, all doors will be open to you. If you will try to accustom yourself to the position, and realize from the start that there is no romance and never can be any between us, I believe that we shall get along quite well together. But for God's sake leave me alone. Do not come near me except when we are in public, or you will force me to repeat to you the brutal truth that you are actually repulsive to me." And so began the life of Elizabeth Drexel and Harry Lehr. The bride was crushed by the humiliation her husband passed on to her on her bridal night. She suddenly felt trapped because her mother, to whom she was devoted, so highly disapproved of divorce that anyone who did divorce in her circle was then eternally banned from her company. Furthermore Elizabeth had no outlet, nothing, no one to confide in. His secret was now her secret, although she still had no idea what his secret was except that women were "repulsive" to him." Because of that, she stayed in a loveless, unconsummated marriage for 28 years. But hey, she was rich, right? And apparently, even a Victoria's Secret Angel wouldn't be able to turn his head. 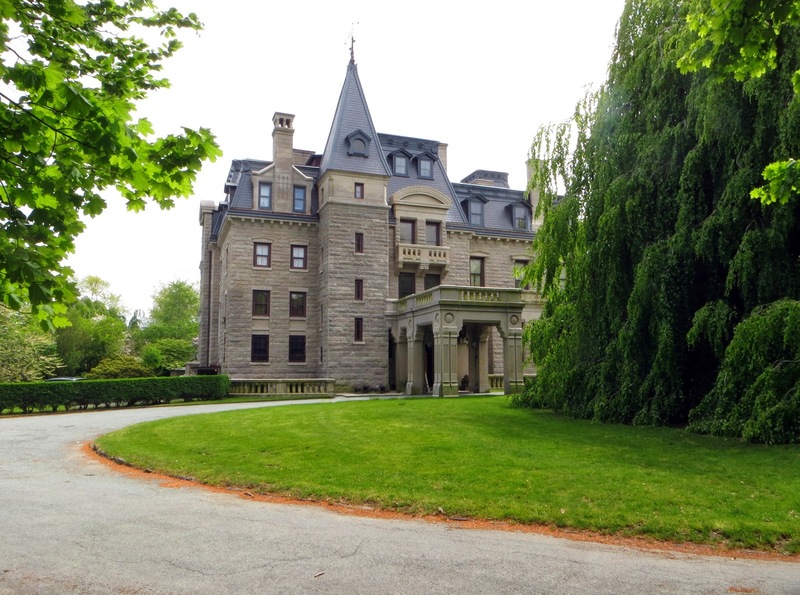 You can see the 2012 Victoria's Secret "Tell Me You Love Me" commercial, filmed at The Elms, here. My favorite room in the entire house was the Conservatory. It was light and bright and airy and cool. It was located between the library and the drawing room, at the back corner of the house with its fourteen-foot windows facing the gardens. See the floor plan of the house here. Upstairs, there were seven bedrooms, six bathrooms, a large sitting room, a small sewing room, and a linen closet. Although ornate by today's standards of normal living, the house was very comfortable and more livable than some of the other mansions. What was shocking to learn was that in 1962, The Elms was sold and slated for demolition to make room for a shopping center. Luckily, the Preservation Society purchased the home at auction and saved it so people like me could walk and gawk. It's hard to believe anyone could think another strip mall would be more important than saving this spectacular house. Today we visited Marble House, another Newport mansion. This one belonged to Alva Vanderbilt and her husband William K. Vanderbilt. He gifted it to her for her 39th birthday. In 1892, a gift of this caliber cost $11 million dollars. Today, that gift would cost him over $282 million. That's some gift. And because it was a gift, when she divorced him in 1895, at a time when divorce was rare, she got to keep the house since she owned it outright. This is one of my favorite houses so far. It's amazing. 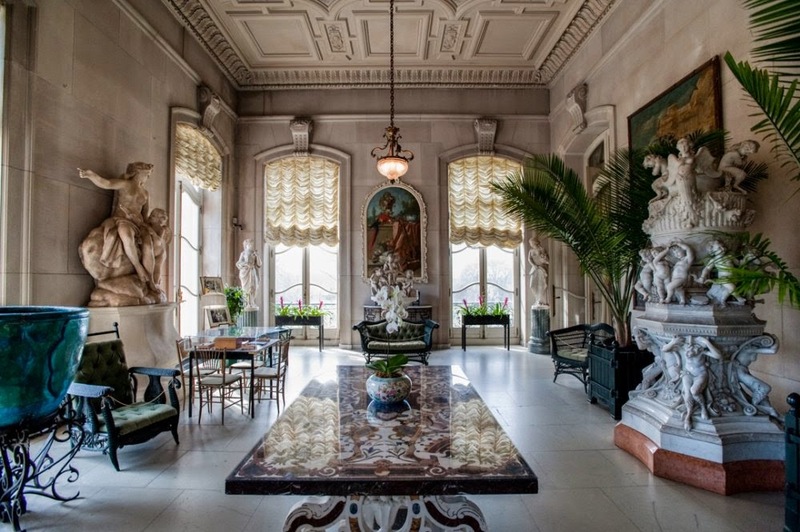 The house has 50 rooms and contains over 500,000 cubic feet of marble. Stunning, cool, smooth marble. This was the Vanderbilt's summer "cottage" and they only stayed in it six to seven weeks each year during the season. They don't allow interior photos in the houses, so the following ones I found on the internet. As you'd imagine, although impressive, they're not as nearly as impressive as seeing it in person is. 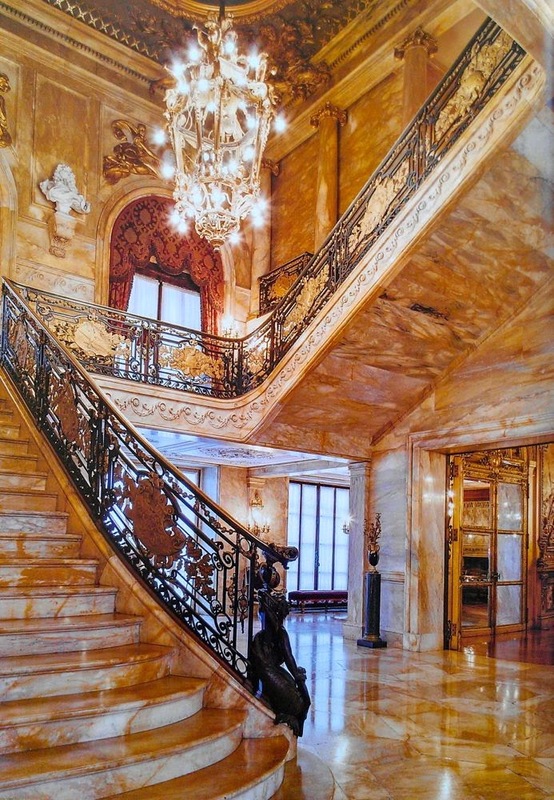 This is the Italian marble staircase in the entry foyer. The Siena marble continues throughout much of the house and was specifically chosen for its golden hue, reflecting the light of the day and the gas lamp lighting in the evening in a way Alva Vanderbilt thought white marble never could. It covers the floors and walls in every direction. To the right of the staircase is the ballroom. Entirely covered in 24 karat gold leaf. That's pure gold, people. It's beyond opulent. A friend of the Vanderbilts described the 1890s as a time of "dazzling wealth, restless endeavor, ambition and rivalry. The 'Gilded Age' had dawned. It merited its name. There was gold everywhere." Literally. On the other side of the main hall is the dining room. The walls there are deep pink Numidian marble imported from Algeria. The chairs are made of bronze, covered in gold leaf. The chairs at each end of the table weigh 100 pounds each and the side chairs, 75 pounds each. Servants moved the chairs whenever the family or guests needed to sit in or rise from them. Most of the rooms in the house were equally impressive. The kids' rooms were much smaller than I imagined and not decorated exactly as I would have expected - for instance, the daughter's room looked very masculine with its dark wood furniture and heavy red drapery and upholstered furniture and the boys' rooms were very stark - but were still interesting. Alva's bedroom, on the other hand, was stunning. 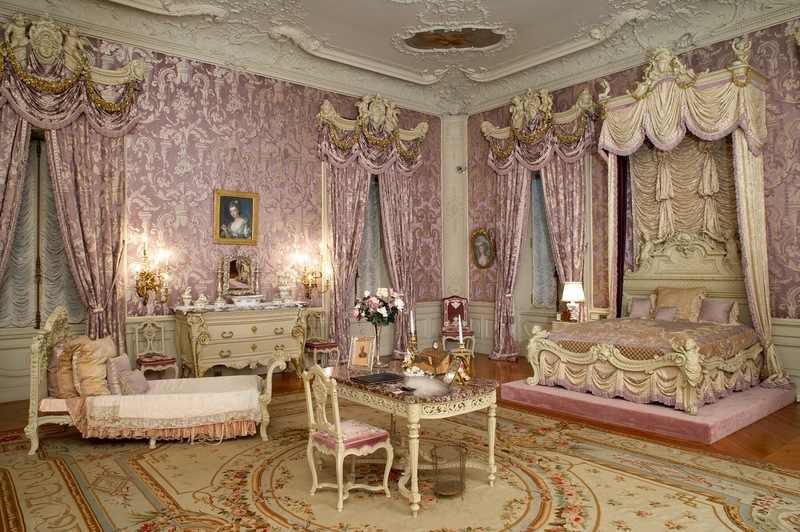 Walls covered in lilac silk, made in France, bed on a pedestal, a painting that included cherubs on the ceiling. It was visually stunning. After watching four seasons of Downton Abbey, it's easier for me to imagine how these people lived their lives. What they did while at the houses, how they entertained their guests, how they spent their free time, what they ate, the clothing they wore, how the women sat on those tiny chairs so elegantly, the walks they took on the great lawns. If they had air conditioning, I'd beam myself back to that time period and take up residence in that lavender silk-covered room. 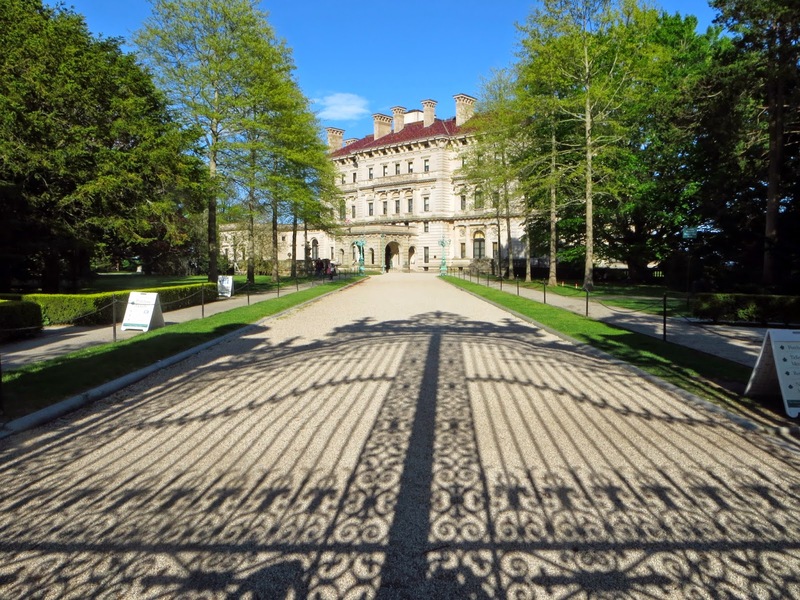 The front drive to The Breakers, the largest of the Newport, Rhode Island mansions. This was the summer home of Cornelius Vanderbilt II. 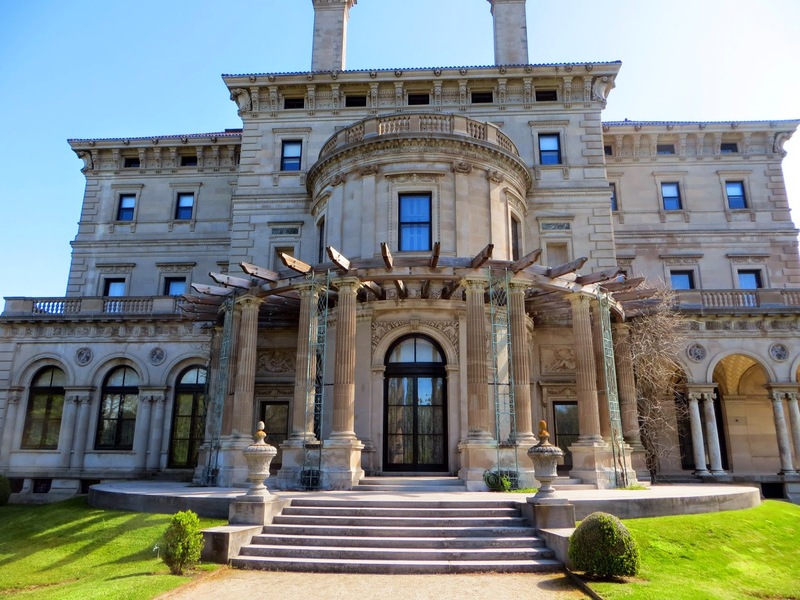 It is the summer home of the Gilded Age. More photos of the mansions and the Newport area to come. Stay tuned!